This Jacket has SOLD OUT. Contact us for other options. Rich and embellished, lightweight and easy to wear, this gorgeous Tunic Length Kimono in handpainted, jeweled silk is fully lined and available in our Size L (26/28). Beaded jacket for plus size mother of the bride, special occasions, unique evening wear for that big night out! Also great over jeans. Price quoted is for the jacket only, and we're delighted to create a simple, silk crepe dress or slinky separates to wear underneath. Handpainted, jeweled, fully lined with lightweight silk crepe to keep it light and breezy. Created to couture standards in our workshop, incorporating over 25 years of experience fitting plus size women of all shapes and sizes. 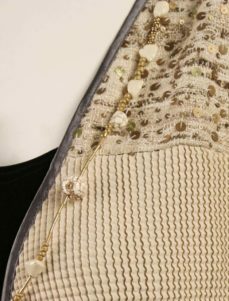 Rich shades of purple, rose, green, sky blue, lavender are hand-embellished with gold threads, tiny pearls and sequins. This jacket measures: SIZE 26/28: Bust 64.25", Hip 64.75", Length 37", Upper Arm 26". Be the first to review “Plus Size Mother of the Bride Beaded Kimono Jacket Silk Purple Turquoise” Click here to cancel reply.